Where'd You Go, Bernadette - My recent "adult book"--it was everything I wanted in a break from YA lit: biting, funny, fast-paced, and surprising. None of that is surprising from Maria Semple, who used to write for Arrested Development. I am currently hunting down her other book, This One is Mine. 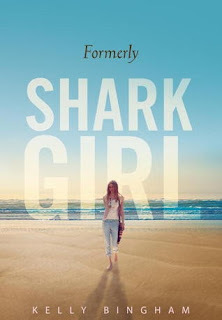 Formerly Shark Girl - The sequel to Shark Girl, this was a nice return to the time when I reviewed a novel in verse each Friday. A year has passed since Jane lost her arm to a shark attack. She has moved on and the new stresses in her life are completing her bucket list and deciding between art school and nursing school. Author Kelly Bingham handles this dilemma well: Jane's heart wants to be an artist, but she feels like being a nurse is the right thing to do. When she makes her decision, the reader is left satisfied with the way Jane's story has been concluded. All the Lovely Bad Ones- I've been a fan of Mary Downing Hahn since reading Wait Til Helen Comes. That remains the book that I suggest to sixth graders who like scary stories. In trying to bulk up the scary book section of my classroom library, I ordered the rest of her oeuvre. While nothing tops how I felt reading that first book, All the Lovely Bad Ones is special in that it has actual ghosts and is genuinely spooky. Plus, the cover is guaranteed to draw in readers. I Funny - In my students' opinions, James Patterson can do no wrong. They all flew through his Middle School: The Worst Years of My Life series and are dying for more. I can't keep I Funny on the shelf. I'm pretty fascinated by Patterson's process, which includes co-writers who fill in the details of the outlines he makes for each chapter. In this way, he can churn out 10 books each year. I'm interested in talking to the kids about their opinion on this style of publishing. Is he really the author? How much credit should the other authors get? Some good conversation topics abound! Capture the Flag- Mysteries are another section of my classroom library which needs to be beefed up. I was excited to add Kate Messner's Capture the Flag to the collection. I do wonder if the American flag on the cover will appeal to my Colombian students. And while the mysterious Silver Jaguar Society intrigues me--its mission is to protect important historical artifacts--I fear the the sixth graders will leave this gathering dust next to Chasing Vermeer. I just requested Formerly Shark Girl from the library, looking forward to reading it. I'm really intrigued to hear about James Patterson's writing process. I had no idea other people were pretty much writing the books for him!